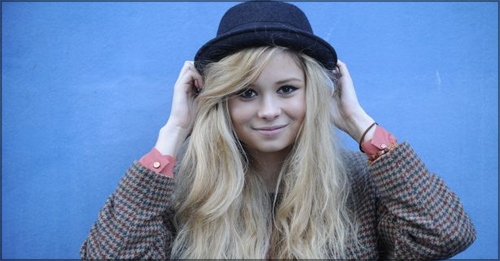 Former gymnast and current recording artist Nina Nesbitt is going to do big things in 2013. Big in the sense of "having a hit record", not solving the debt crisis or taking a bullet for the Prime Minister. But you get the point. I first saw Nina, who's just 18 years old, supporting Rizzle Kicks at the Roundhouse last year. All alone on a cavernous stage, she captivated the audience with a few simple songs and a battered acoustic guitar (whose strings insisted on breaking, much to her embarrassment). After the show, she came out to sign CDs and there were dozens of swooning, doe-eyed teenagers clamouring to meet her. And those new fans are proving to be loyal. Nina's new video went up on YouTube on Monday and racked up an impressive 222,000 views in 24 hours. Rather distrurbingly, though, those same fans have taken to calling themselves "Nesbians". Stay Out is a spritely pop-folk number that tips its hat to Laura Marling and Ed Sheeran (with whom Nina has a history). Targetted at the cool kids who run every sixth form common room in the country, the song's funny, well-observed lyrics are barbed enough to sting, but delivered with enough charm not to alienate.